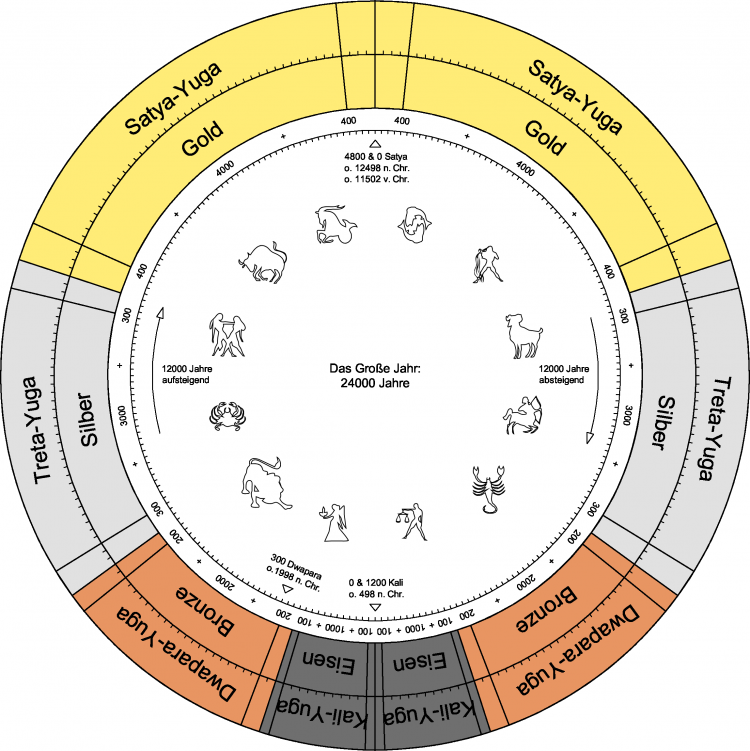 The long-cycle Yuga corresponds to the astronomical alignment of our solar system. It may even correspond to humanity’s advancements. But why? The Earth has a “long cycle” that is in excess of 24,000 years (12 * 2160 years, actually = 25,920, or just under 26,000 years). The ancient texts from India call that period a Yuga, and observe that mankind advances during that period, reaches a peak, and that gradually deteriorates, until it reaches a low point and starts up again. Whether humanity actually follows that progression or not, it is clear that our own dark ages represented something close to a “minimum”, and that we have been steadily advancing since then. What is clear is that the “long cycle” matches the earth’s precession — the degree to which the “North star” changes, over time, until 25,920 years later it is pointed back at that same star. Now then, one explanation given for the rise and fall in humanity’s advancement in a 24,000-year cycle is that the earth is closer to the galactic center at one end of the Yuga than it is at the other, because the solar system itself is a large, elliptical orbit. The orbit of the solar system makes sense. In fact, there are quite a few solar movements to account for. But the “explanation” for mankind’s advancement during a given phase of that orbit lacks credibility — because the difference in position is infinitesimally small, on a galactic scale. So to my mind it offers no real “explanation” as to why mankind is more enlightened and advanced at that time. I buy that the observations of our Yugas are accurate, but the traditional “explanation” given in Yoga texts doesn’t really explain anything at all. The problem, of course, is that the mind tends to accept any kind of plausible explanation, without really understanding it. Having an explanation therefore fills some sort of “psychic gap”, even if it makes no real sense. For example, we used to think that everything was made of earth, air, and water. We used to think the planets revolve around the earth. (We could see them doing it!) Today, Ayurveda still uses concepts of that kind to explain its system of healing, and we accept the idea of “gravity”, despite the fact that no one to date has ever actually explained exactly what that is. And even if the positioning is as described, it’s a correlation, not a cause. There, are however, recent advances that suggest a potentially more convincing explanation. There are still gaps to fill in, but newer models of an electromagnetic universe, combined with observations that suggest we are in a dual-star system, combine to create a really intriguing story! The ingredients for that explanation are provided courtesy of YouTube U—a collection of videos I’ve amassed on the subjects of electromagnetism and other possible explanations for the scientific technology that helped to create the pyramids and other “megaliths”—especially the ones that were noteworthy for their precision, as well as for their size. We used to think that binary star systems were rare. So we didn’t think we were in one. But now we now that multiple-stars in a single system are the norm, rather than the exception. What’s rare is find a star that is on its own. Whether it is that star or some other, the fact is we know there is one. We know, because precession is not constant. Precession, of course, is the observation that a different constellation appears on the horizon every couple of thousand years. So we were in the age of Pisces for a while, and then began entering into the Age of Acquarius. The thing is, the rate at which the change occurs has been speeding up. If precession were caused by a wobble in the Earth’s rotation, that wouldn’t happen. If anything, it would be slowing down. But if our solar system is in an elliptical orbit with another star, we would see such a change. At the narrow end of the orbit, when our companion star is closest, the change would be most rapid. At the far end of the orbit, the change would be slowest. Since the rate of change is accelerating, we can deduce that our companion star is approaching us—and vice versa. As I wrote in Could Our Dual Star be Arriving, from Raja Yoga Insights #13, a huge number of insights have been occurring to me, of late. More than normal, even for me! Of course, the Raja Yoga course has sparked most of them — but even so, my meditations have been unusually productive! If it turns out that we are in a dual-star system, and that star is Sirius, then is noteworthy that Sirius is itself a dual-star system, with a visible Sirius-A and gravitationally dense dwarf star, Sirius-B. Going to YouTube University, as I have been (“YouTube U”, as I affectionately call it), I have been intrigued by models of the “electrical universe”, the behavior of plasma (the fourth state of matter, a superhot gas), and the actual of shape and behavior of electromagnetic force fields. Now, in the Electrical Universe model, there is no such thing as “gravity”. There is simply (and only) electromagnetism, which can nicely explain everything we observe in the physical universe, from photons and electrons up to planets and galaxies — without the need for “black holes”, “dark matter”, and “dark energy”, all of which have huge theoretical problems, and which never have been (and never can be) observed. So, yeah. I am a fan of the Electromagnetic Universe theory (which, I suspect, is a better name for it than the “Electrical Universe” theory — but either one will do). I bring that up, because if “lesser gravity” is the explanation for things like the ability to build the pyramids and higher thought processes, there is the problem that the effects would only be good for half the day (when the external gravity was pulling away from the earth). But things would much heavier the other half of the day — perhaps even crushingly so, which would not be good for progress. But clearly, we are progressing, moving from the dark ages toward a more enlightened state, so the gravity model makes a lot less sense that some sort of electromagnetic influence. Now then, if we are beginning to approach a companion star, and if there is an electromagnetic effect, it would make sense that the effect would not be dependent on where the Earth happened to be in its daily rotational cycle. And if that effect has the appearance of “lightening gravity” in some way that has yet to be explained, then it could well help to explain how the pyramids got to be built, and why are thoughts are flying higher! Experiments with ball bearings in a magnetized field show that they arrange themselves symmetrically in a “plate”, between two bowl shaped electromagnets. Other experiments demonstrate that the shape of a magnetic field is very similar two bowls placed end to end. Those fields interact with one another. The interactions would largely be independent of the spinning of the earth, which induces the magnetic field (unlike gravity—see the note below). With this theory, the actual shape of a magnetic field looks like two bowls placed back to back. The video demonstrates that when you place a magnetized pin adjacent to the fields, you get the familiar picture of a magnetic field flowing out one end and looping around down to the other — but the fact that pins or iron filings in the field arrange themselveswith the orientation we see does not necessarily mean that the actual magnetic fields are shaped in that manner. With the “inverted bowls” theory we get the exact same orientation of filings and so on — but we get a huge increase in explanatory power in other areas. Evidence suggests that collections of magnetically-active produce an hourglass field, and that the individual particles respond to that field by producing the kinds of arrangements we see in galaxies and solar systems. The existence of those fields nicely explains the particle/wave duality of light and other electromagnetic flows. That theory also dispenses with need for the concept of “gravity” (a theory which predicts things nicely, but which does not necessarily explain anything, since no one has any idea what gravity is — other than “a curve or bend in space-time” (another model with great mathematical predictions, but which does not really explain anything, since no one knows what it really is). Interestingly, the curvature of light around the sun was the “proof” of Einstein’s theory of gravity — but that curvature could easily be induced by the sun’s magnetic field on photons which are, in essence, point magnets. One thing the electromagnetic theory does noteasily explain is the equivalent attraction of a large mass and a small mass (for example, a tennis ball and a bowling ball). It would make sense that a larger mass has a stronger magnetic field, so the rate of attraction should be greater for the larger mass. One possible answer is that the difference between a tennis ball and a bowling ball is negligible, compared to the mass of the earth. So it may be that early experiments simply were not precise enough to measure the difference. But if the electromagnetic theory holds, there should be some difference, however slight. It’s tempting to consider gravity as an explanation, but then we would be seeing extreme changes in gravitational forces every single day, when our sister star is close! We know we’re coming out of a dark age, and there has been no sister star in sight for millennia. So the time of “high advancement” must be when our companion star is near. But if we were seeing huge gravitational fluctuations on a daily basis, it’s difficult to see how humankind could ever make any kind of progress! Then there is fact that we simply don’t know what gravity is! With gravity as the “explanation”, science first had to create a theory of “black holes” to explain the universe as we know it. Then scientists had to invent “dark matter”, and finally “dark energy”, in order to explain what we see. The entire intellectual edifice is constructed on a foundation of sand—gravity—which we don’t understand, and can’t explain. We can measure it, of course. But that’s a lot different than understanding Electromagnetic theory, meanwhile, gives us a mechanism we can observe and understand—one that works at the subatomic scale, the normal scale, and the cosmic scale, one we can experiment with and that provides many useful predictions. There is little doubt, then, that future generations will back on our current scientists and laugh, the same we laugh at people who thought the sun and planets revolved around the earth, and people who think the earth is flat. If a companion star is headed our way, then it could produce the kind of tidal displacements that led to global floods, and the kind of meteor activity that led to the “serpent in the sky” legends of the Aztecs. It could also have created a kind of magnetic “intensity” that assisted in the building of the pyramids—structures which were possible built for the express purpose of either harnessing that energy, or shielding ourselves from it, or simply to tell future generations that it was coming. Note, too, that in addition to pyramids, there are man-made cave systems all around the world, as well — huge systems, capable of housing an entire village. One suspects that they were created to protect mankind from large meteor events – and, given that it might have been necessary to reside there for two or three years, it would have taken a fair amount of advanced technology to do so. We know, too, that birds and animals react to magnetic fields. As do we. The interaction of a companion star with our own would create an interaction between the magnetic fields that would need to be studied, in order to be predicted. And there would be effects on mankind that also need to be studied. Because the reality, more than slow and gradual circle, may be more like a continually ascending ramp, punctuated by a sharp valley when the downside of the stellar conjunction arrives. In other words, the magnetic interactions may have us continually growing and expanding as individuals and as a civilization, only to see us hammered back into the earth when the meteor showers and gravitational tides impact us. At that point, with civilization in taters, the capacity to maintain things disappears. Eventually, the technological remnants disappear, too. At that point, all that is the left are the stories that are handed down from one generation to the next. That process, in all likelihood, explains the “myths” that are prevalent in our society. Because the fact is that ancient civilizations had no idea what “fiction” was. They would tell a tell, and it would expand in the telling, but it was always based on reality. So when India legends talk about “flying machines”, I take them at their word. I believe them. It doesn’t take long, either. Imagine trying to describe a television to a child who has never seen one. Or an airplane. Or the internet. Or a microwave, or any of thousands of things that are now commonplace. Now imagine that story passed on to their children. It’s not hard to see those stories evolving. But they were always founded on truth. We have to see the “flood legend” and other “primitive” myths the same way—as the harbinger of a fate that has fallen to us in the past, and that will do so again in the future.